Designing a great report is a multi-skilled, challenge for any design agency, but when done well, can be a multi-functional document for any organisation. A fundamental part is understanding the content, the structure of the narrative, and using the most suitable design elements to convey that in the most effective, engaging way to stakeholders. 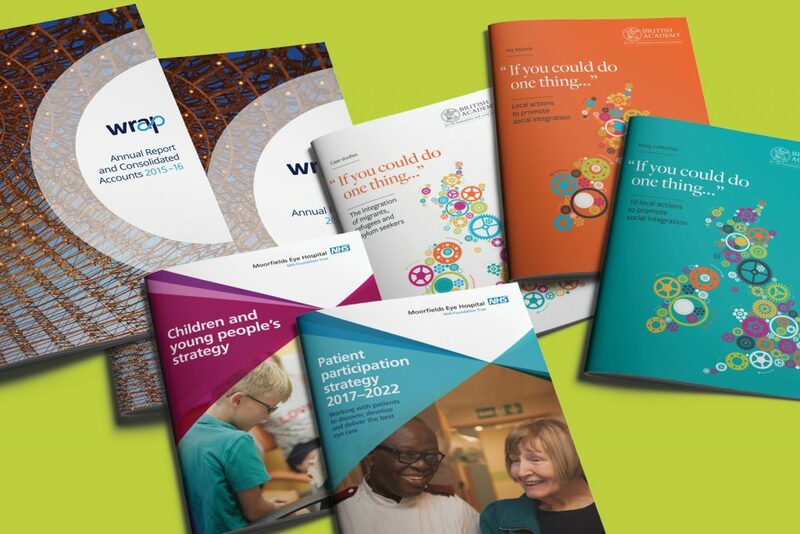 At Kenroc we enjoy the challenge that each report gives us and continue to produce a range of reports for charities, youth organisations, government departments, environmental groups, universities, hospitals and healthcare companies. A range of elements can be very effective in the story telling of a great report and we have covered these briefly in our 5 step guide. A fundamental part of any report is good navigation. Your audience may have interests in different aspects of your report, so good clear navigation is key, so they can easily find what they’re interested in. There are various ways this can be done, through clear accessible content page, colour coded sections, section dividers, running headers or from a great narrative along with other well designed elements such as strong typography, great photography/ illustration and clear data design. A strong typographical hierachy can vastly improve the reader experience, helping identify key areas of your report. Headers, subheads, along with facts, figures and pull-out quotes, can all add layers to your story and provide a document that becomes accessible to a variety of audiences. Choosing and Investing in good photography, whether commissioned, or from image libraries, is a great way to illustrate your story, and convey your achievements. Image libraries have come a long way and the quality is great, free to use imagery is increasingly available and can offer a budget friendly option. If you commission a photographer, you will retain the image rights as well as giving the story credibility through unique images showing real people and places related to your story. A good story where strong factual evidence is available can be enhanced and help the reader understand its impact through infographic design. They can help your audience quickly identify and understand elements of your story and illustrate any positive impacts that your organisation has made. A strong report contains good data as evidence of the impact an organisation is making. This element of a report shouldn’t be overlooked as it can really help the reader understand important facts and trends related to your story. Charts need to have great clarity through keys, colour coding and typography. As seen in some examples below, the addition of big facts and figures help with clarity of data. 0 Comments on "Kenroc’s 5-step guide to creating effective impactful reports"